In the current society young people are more and more attached to social media communication losing their connections in real life. Also their activity within the field of active citizenship moves to the platform of social media. The aim of this project is to make its beneficiaries realize that the pursuit for the common goal can establish much stronger and lasting relationships that might be acknowledged many years after the project is finished. The participants will together create community gardens to meet their need to learn about ecology, establish a connection with the nature, need for work with the natural materials, ensuring the sustainable living, ability to respect nature, waste less and recycle more. The community gathers to create their own gardens, to plan and to get involved in the activities around the gardens. They maintain the garden. They participate in the educative lectures where they learn what is the community garden, how to create it, how to maintain it. The participants are involved in creating the gardens which will give them the opportunity to learn manual skills. After gaining these skills beneficiaries can inform other people in their community and spread the information about the urban community gardens and involve other citizens in similar activities. 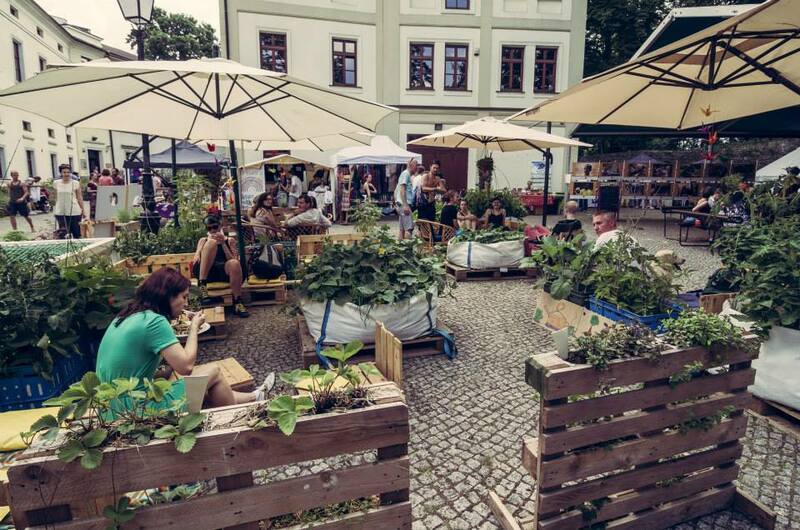 Throughout these activities they will show that they can actively and reasonably spend their free time involving their local community in the activities and at the same time contribute to it by changing the urban space to a green oasis giving more than added value in the form of fruits and vegetables. The main promoters of the project are local NGO’s that together agreed on creating and realisation of the project. Secondary players and beneficiaries together with the main promoter play main roles. Promoters together with beneficiaries decided on the design of the community garden, planned the activities and realized the idea by their own means. The project stressed the importance of three level cooperation between the Local government, third sector and the citizens. We have invited an Professional team Pracownia K. from Cracow to help us design the space according to the needs of participants and aims of the projects. It is a couple that specializes in natural design within urban context. They made workshops for the project participants based on the analysis of their needs. After the analysis they organized workshops which helped the participants to suggest their own vision of the urban garden. With the help of the Pracownia K. participants designed their vision of the garden. Later these ideas were put together to the complex project.